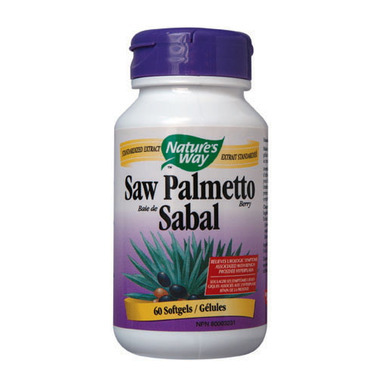 Nature's Way Saw Palmetto extract is standardized to 85-95% fatty acids. Using a liposterolic extraction method, this product provides the clinical dose for promoting prostate health. Saw Palmetto berries are the deep coloured fruit of a small palm that grows wild in warm climates of the Southeastern United States. Directions: Adults: (Men): Take one softgel capsule twice daily at mealtimes. Use for a minimum of three months. Other Ingredients: Olive oil, gelatin (softgel capsule), glycerin, water. Warning: Consult a health care practitioner prior to use if you are taking blood thinners, or if you experience gastrointestinal discomfort. Consult a health care practitioner if you are taking any hormone therapy or if symptoms persist more than six months.